This is Major, he was a Tennessee Walking horse. He was the first horse we took in and also the head of the herd. He came to us through our friend and neighbor, Jeanne Mirabito, owner and president of Our Mims Retirement Haven. Sadly Major passed away in Oct of 2008 of congestive heart failure, he was 33. He is and always will be greatly missed. He is buried here on the farm. This is Sir Knight. 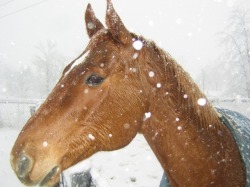 He is a quarter horse and he was with us for 6 years. He came to us from the same farm that Minnie was on. He used to take the children for an occasional ride around the yard but you can not let him know what you have in mind or he would come limping into the barn. He was a great actor. He is missed and still loved. Knight is buried here on the farm. 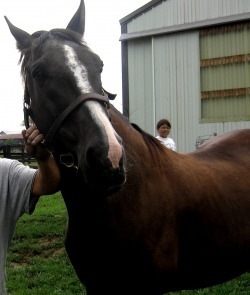 Knight joined our family in 2006 and passed at the age of 33 in 2012. Darling came to us from a high kill shelter. She was a very sweet girl but sadly she had tumors in her lungs. 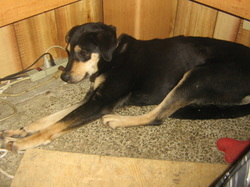 Her favorite things to do were lay under the computer desk or just sit with her head on your leg. Darling stayed with us until she was no longer comfortable. 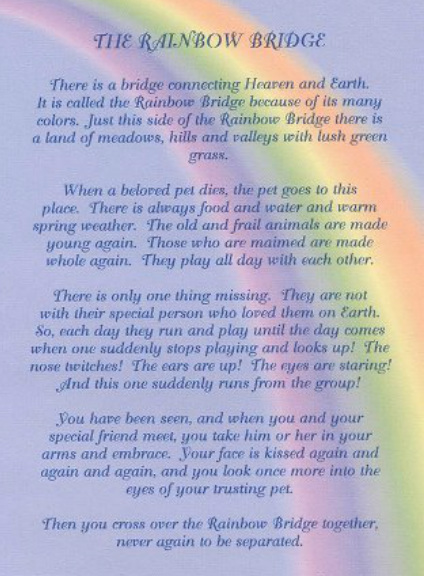 She crossed the rainbow bridge in 2011.